... and it's not the Bathurst 1000 or the grand prix. Though that depends how motor sporting events are measured. Is nearly 600 machines enough? These days, the two-make Bathurst 1000 has about a mere 30 starters, down from over 60 in the good times. The Australian Formula One Grand Prix had a grid of 20 cars this year - six fewer than when F1 was healthier. 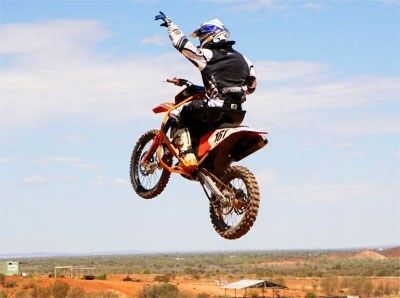 In one respect at least, the 34th Finke Desert Race held near Alice Springs can lay legitimate claim to being the nation's biggest motor sporting contest, at least in competitor numbers. Set for two gruelling 230km legs this long weekend - one on Sunday and another on Monday - the Finke has attracted no fewer than 496 motor cycle competitors (from NSW, NT, Qld, Vic, SA, WA, and ACT) and 77 car/buggies (from all states and territories bar the ACT). Lining up this weekend are five previous outright motorcycle winners of Australia's greatest desert race - Ben Grabham, Ryan Branford, Darren Griffiths, Jason Hill, and Michael Vroom. Previous outright car/buggy winners Dave Fellows/ Andrew Kittle, Hayden Bentley, Shannon Rentsch, and Mark Burrows have returned for another crack. The enthusiasm for off roading and this particular race has not been affected by the tighter economic times. In fact the entry for the buggies/cars is up 10 on last year. The Tattersall's multi terrain race slices through spectacular desert country from Alice Springs to the small Aputula (Finke) community, and is now one of the biggest annual sporting events in the Northern Territory. It is recognised as the richest off-road race in the Southern Hemisphere with the added reputation of being one of the most difficult courses in one of the most remote places in the world. The race started modestly in 1976 as a 'there and back' challenge for a group of local motorbike riders to race from Alice Springs to the Finke River and return. It has been held annually on the Queen's Birthday long weekend ever since. The race is run along sections of what was the Old Ghan Railway service track adjacentto the railway line along a winding corrugated track, which snakes through typical outback terrain of red dirt, sand, spinifex, mulga and desert oaks. Initially only a bike race, the Finke's increasing popularity saw the inevitable introduction of cars and off road buggies in 1988. A fierce rivalry immediately developed between the two and four wheelers for the outright 'King of the Desert' crown. The Finke is conducted by an organising committee of eight, plus an army of 340 happy volunteers. The event has a turnover of $500,000 but wages bill of only $13,000. It provides an unconditional economic bonanza to Alice Springs with interstate competitor teams alone spending $3million. And organisers don't hold the local government to ransom either. 8.3km time trial to determine starting order. Cars at 8.30am, bikes at 11.30am. Yesterday was so good, that competitors do it all over again, in the other direction. Cars leave at 7.30am, the first to arrive by 9.30am. Bikes start at 11.30am, the first due about 1.30pm.